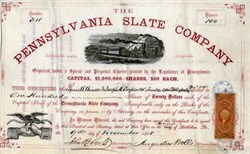 Beautiful certificate from the Pennsylvania Slate Company issued in 1868. This historic document has a vignette of an old train in a mountain pass. This item has the signatures of the Company’s President, Augustus Wolle and Secretary, John Roberts and is over 149 years old. The Pennsylvania Slate Company had extensive quarries in Pen Argyl, Pennsylvania located in the northwest part of the state. Pen Argyl is a borough in Northampton County, Pennsylvania. In 1882 the Town Council officially adopted the name Pen Argyl which Augustus Wolle (the prime founder of the Bethlehem Iron Company) had invented in 1865 when he visited this area. "Pen" is the Celtic word for "mountain", while "Argyl" is from the Greek word meaning "slate rock". Augustus Wolle was also the founder of Bethlehem Steel when he organized the the Saucona Iron Company. The company's name was later changed to the Bethlehem Rolling Mill and Iron Company. On May 1, 1861, the company's name was changed again to the Bethlehem Iron Company. Construction of the first blast furnace began on July 1, 1861, and it went into operation on January 4, 1863 The first rolling mill was built between the spring of 1861 and the summer of 1863, with the first railroad rails being rolled on September 26. A machine shop, in 1865, and another blast furnace, in 1867, were completed. During its early years, the company produced rails for the rapidly expanding railroads and armor plating for the US Navy. Though our pioneer industry, the Zinc Works, was in operation as early as 1853, the very rapid growth and prosperity of this community really dates from the opening of the railroad lines. Without the facilities for transportation thus afforded, the greatest of all our industries, The Bethlehem Steel Co., would have been an impossibility. Naturally, the large land owners of the new town were desirous of promoting the value and sale of their holdings by inducing manufacturers to locate their establishments here. Thus, the late Charles Brodhead, about 1854, endeavored, through U.S. Senator Richard Brodhead, father of our Judge Brodhead, to secure the location of a government foundry here. But, though the project was favored by the then Secretary of War, Jefferson Davis, it failed to receive favorable Congressional action. Mr. Brodhead then, in 1857, joined with Augustus Wolle, the father of the Bethlehem Steel Co., in the organization of “The Saucona Iron Co.” Mr. Wolle had conceived the idea of locating a blast furnace on Saucon Creek for the manufacture of iron from ore from the nearby "Gangewere Mine”, of which property he had recently become possessed. Having also acquired the Rauchs' portion of the Luckenbach farm, he was persuaded by Mr. Brodhead to erect works on this land rather than on the Saucon, to broaden the scope of his Company, and to change its corporate title to that of "The Bethlehem Rolling Mills & Iron Co.” The original subscribers to the new undertaking were Augustus Wolle, Charles Brodhead, Charles W. Rauch, Ambrose H. Rauch, Charles B. Daniel, and the Moravian Congregation. 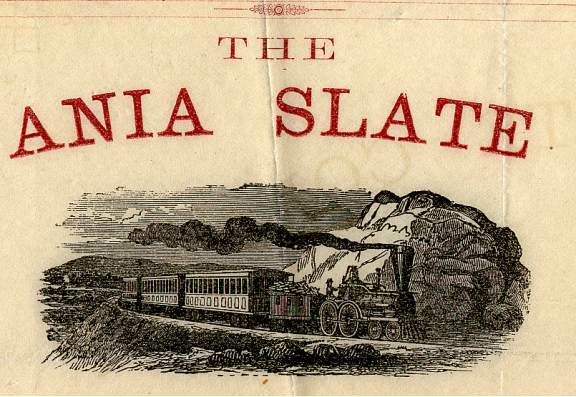 The financial panic of Buchanan’s Administration halted this project, but, in 1860, the late John Fritz, a noted iron-master of Johnstown, was engaged to superintend the erection and the operation of the new works. On June 14, 1860, the Company organized with Alfred Hunt, President; Augustus Wolle, Asa Packer, John T. Johnston, John Knecht, Edward Roberts, Charles B. Daniel and Charles W. Rauch, Directors; Charles B. Daniel, Secretary and Treasurer. On May 1, 1861, the corporate title of the Company was changed to “The Bethlehem Iron Co.” Seventeen acres of land on either side of the L.V.R.R. having been secured, on July 16, 1861, ground was broken for the first blast furnace. This, however, on account of the Civil War, was not completed and lighted until January 4, 1863. The next day the blast was turned on by Miss Kate Powell, of Philadelphia. The first iron was smelted from a mixture of brown hematite from the Saucon Valley and magnetite from Morris County, N.J. The rolling mill, commenced in the spring of 1861, was finished in the summer of 1863. The first iron was puddled July 27, and the first rails — for the L.V.R.R. — were rolled September 26, of that year. The second furnace was commenced in May, 1864, and completed in March, 1867. The original machine shop was built and equipped in 1865.